It doesn't all have to be about the fear- have a happy Halloween with these apps too. Not just for kids but I'm going to make an eclectic list that will appeal and hopefully bring a Halloween smile to everyone's face. Thanks to CoolMom Tech for the tip off. 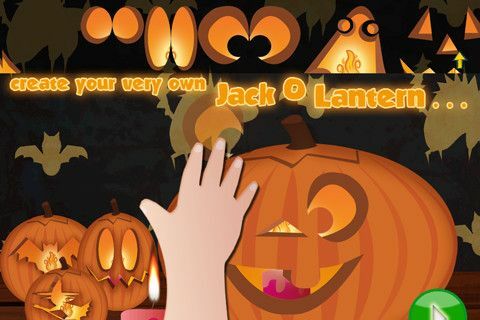 If you own an Android phone, here is a great little fun Halloween app for you. If you or your little one are especially pleased with you creation you can even share it to various social networks like Facebook. You can also use the Scary Me! feature of the app to generate a card for you. You can download Hallo, Monster! for yourAndroid phone for free from here. Hey gamers! Kynitex is happy to announce a special Tomb PinBall and Love Twist updates - right in time for Halloween! Enjoy Jimmie the Crazy Skull's creepy cemetery world ready to celebrate Halloween! Help Jimmie to earn scores and decorate its cozy cemetery even better for celebration! Compete with Mindy the Cutie Skull to win in a special Halloween tic-tac-toe level! Download creepy Tomb PinBall Halloween edition for FREE right now!